Thank you for visiting our Supporters Page. 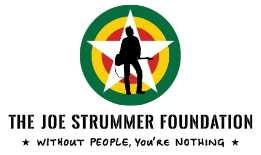 The Joe Strummer Foundation gives opportunities to musicians and support to projects around the world that create empowerment through music. We are a registered not for profit organization in England & Wales and we are 501(c)(3) approved in the United States. We rely on donations to allow us to continue our work and gift aid can be added to your donation if from these countries. Please give only if you can afford to. We have partnered with Chuffed.org to make the donation process even easier and more secure. Click on the above donate button to be taken to our SSL secure donation page.